Simple yet effective items that help your establishment remain clean and professional. Prevents commercial bathrooms from getting filthy and unsanitary. Ensures your establishment abides by all governing rules and regulations – pertaining to clean and hygienic bathrooms. Patrons never have to worry about sitting on dirty or soiled toilet seats ever again. In fact, we feature automatic disposable toilet covers for all new and existing establishments. 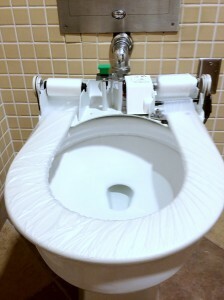 Why Use Disposable Toilet Seat Covers in Your Establishment? At Brill Hygienic Products, we understand the concerns of all new and existing business owners. This is why we work hard to create products that will keep your business looking clean and presentable. In fact, we offer several types of disposable toilet seat covers that will truly meet all your needs. Our wholesale sanitary toilet covers are also the perfect alternative to pricey sets at local stores or venues. In fact, automated toilet seat covers are used only once – then automatically cover the seat after each use. 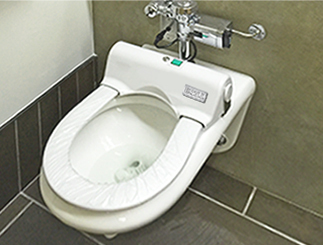 Automatic covers also remove the need for purchasing huge quantities of disposable toilet seat covers as well. This is truly a cost-efficient way to reduce the risks of contact with germs for your customers and clients. Hospitals, medical clinics, emergency care venues. Office buildings, movie theaters, sports arenas, and entertainment venues. Any and all commercial venues with public bathrooms and restrooms. Whether you need toilet seat covers for restaurants or hospitals, we got you covered. At Brill, we truly want to help you maintain and keep a sanitary workplace. This is why we work hard to ensure our products meet the needs of all our new and existing clients. As a seasoned and reputable company, we continue to receive stellar industry and customer reviews. This gives us the incentive to work harder and provide more excellent products and services to you all. We also abide by stringent health requirements and guidelines for all our disposable toilet seat cover products. This means we always maintain the highest standards when it comes to delivering quality products and services for all customers. Regardless of what kind of business you own, we want to help you provide the best possible experience for all your customers. Sadly, many business owners tend to overlook the importance of having clean and sanitary restrooms. Brill Hygienic Products features a full line of wholesale sanitary toilet covers that help secure a germ-free environment. We also help business owners select the right products they need for their establishments. With online support and customer service, we are always here to answer any and all questions or concerns you may have. In this day and age, business owners cannot afford to have too many negative reviews or testimonials. In fact, lack of restroom cleanliness can truly propel any business into a negative light. This can reduce customer patronage and recurring business as well. With this in mind, something as simple as disposable toilet seat covers can establish your business as a true professional entity. In fact, it shows your customers how much you care about offering them clean and safe bathrooms and restrooms. For more information or to place an online order, simply contact us or visit our website today!